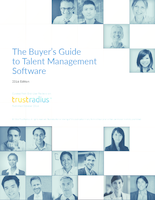 A primer on talent management software for those new to the field. Detailed profiles of 11 talent management suites along with their pros/cons, customer demographics, and best-fit scenarios to help you understand the best choice for your use case. End-user ratings across product attributes and features. A discussion of key market dynamics and trends. 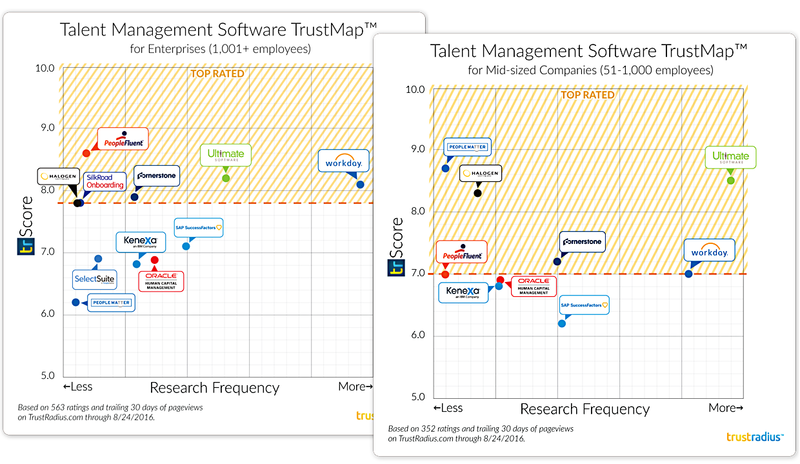 TrustMaps showing the best talent management software for mid-sized companies and enterprises, based on user ratings and buyer research frequencies on TrustRadius.com. We cover a range of talent management products not all of which have precisely the same set of capabilities or starting points. However, these are all suite products and typically include recruiting, onboarding, performance management, succession management and, sometimes, learning management. Some products included in our Core HR guide are also featured here as they contain significant talent capabilities and are often considered alongside pure talent management solutions when procurement decisions are being made. The dividing line between these categories is blurring and may vanish at some point in the future as vendors strive to offer a complete range of capabilities under one roof, or begin to open up applications and allow customers to mix and match via (in some cases pre-built) API integrations and partner ecosystems.